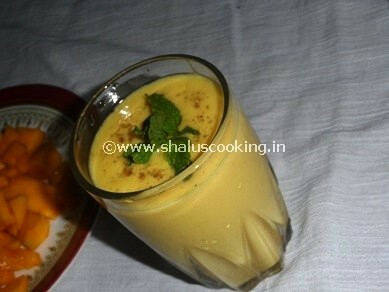 Mango Lassi, this is one of the easy to prepare refreshing drink for this summer. Lassi can be made in variety of ways like Plain sweet lassi, salt lassi and flavored Lassi. Flavored lassi can be prepared in both sweet as well as salt lassi. The ingredients used for the flavoring will differ for sweet and salt lassi. We'll make fruit flavors in sweet lassi and for salt, mint and cucumber can be used. My family's favorite is Mango Lassi! Ripe Mango - 2 No. Sugar - 3 to 4 tbsp. 1. Keep all the ingredients ready to make mango lassi. Peel and cut the mangoes into small cubes. 2. Add all the ingredients except cardamom and mint leaves into a blender and blend it until smooth. 3. Pour it into a serving glass and garnish it with cardamom powder and mint leaves. Yummy Mango Lassi is ready to serve. Tastes awesome when it is cold. You can add ice cubes while serving. But adding ice cubes may reduce the thickness of the lassi. Instead you can add the chilled milk and yogurt to prepare the lassi.